ESYLs are Explorer Scouts who volunteer alongside adult leaders in a Beaver Colony, Cub Pack or Scout Troop. A valuable asset to any leadership team, ESYLs play an active role in the section, bringing a range of fresh ideas to the table, and acting as positive role models for the young people they work alongside. Although the Scheme is usually taken on by Explorer Scouts looking for a new challenge, young people from outside Scouting can also participate if they are working towards their Duke of Edinburgh’s Awards or Queen’s Guide Award. They can do this by volunteering as non-members for a set period of time. For example, if they are completing their Bronze Duke of Edinburgh’s Award, they can volunteer as a non-member for three to six months (the time required for the Bronze DofE volunteering section). The ESYLs’ Scheme is the training programme for ESYLs. It contains 11 modules and four missions for ESYLs to work through whilst volunteering in their chosen section. Modules give ESYLs the skills and knowledge to be successful in their role, while missions allow them to put everything into practice with support. 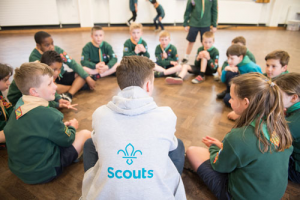 As well as developing valuable life skills, the Scheme is an opportunity for ESYLs to make a positive impact in their communities and to fulfil the service elements of many of the top awards in Scouting. Recognition of achievement is available along the way, and on completion of the Scheme, the ESYL is awarded with an ESYL belt buckle.